Sonja leads Blandin Foundation’s work to fund Minnesota organizations, which seek to grow healthy and vibrant rural communities, and its Education Grants scholarship program, available to graduates of Itasca area high schools. Sonja considers herself a rural advocate and grew up in a small town of 2,000 people in rural Denmark. After completing her education, she moved to Wyoming and –in addition to advancing her business and entrepreneurial ventures — engaged in nonprofit leadership, foundation leadership and volunteer and consulting opportunities to advance the lives of rural residents. Merrild’s work in rural community development and grant-making has included work for the WellPoint Foundation in Indianapolis, Ind., the Marna M. Kuehne and Homer A. & Mildred S. Scott Foundations in Sheridan, Wyo., Tailwinds, LLC nonprofit consulting in Sheridan, Wyo., as well as assessment planning and research with the Blandin Foundation. 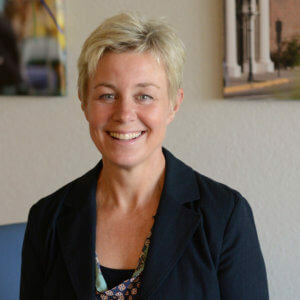 Prior to her work in the nonprofit field, she co-owned and managed a Sheridan-based national real estate franchise, directed the marketing and business development team for a Midwestern architectural and engineering firm, and managed the office of a Nevada-based professional leadership training organization. Merrild holds the Master of Arts in Philanthropic Studies degree from the Lilly Family School of Philanthropy at Indiana University, a certificate in Nonprofit Management from the School of Public and Environmental Affairs at Indiana University, and Bachelor of Arts degree in business administration from the Niels Brock School of International Business in Copenhagen, Denmark and in leadership studies from Bellevue University in Omaha, Neb. Sonja currently serves on the boards of the Grand Rapids Area Community Foundation and Community Giving of St. Cloud, Minn., and chairs the Grand Rapids Arts and Culture Commission. In her free time she enjoys gardening, cooking, yoga and taking in the outdoors of northern Minnesota on foot and water.